Book about the issues faced by children raised overseas (by parents who had jobs overseas), who then come back to their "passport country" and have to deal with incredible feelings of unacknowledged loss, questions of identity and the search for a place to belong. These are the very reasons that motivated me to write my own story so it was eery to only just now be hearing about a whole population of people called Third Culture Kids (TCKs) and Adult Third Culture Kids (ATCKs). As if I didn't have enough subcultures to contend with. I heard the term two weeks ago when I gave a talk to a book club that had just read my book. Then, last week, my Canadian raised, Malaysian editor linked me to the TCK organization via facebook and I've been immersed in this material since. 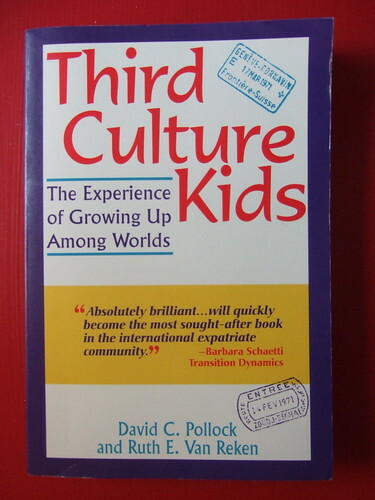 The book divides these kids into roughly three categories 1) Missioinary Kids (MKs), 2) Military Brats and 3) International Business families. Except for the MKs these were the kids I went to school with or who lived in my neighborhood in Bangkok (BKK). I would also add the category of nomadic academics since my best friend Pippa's father was a professor and that is also a common job overseas. The book claims that the term also includes biracial and bicultural children, but then doesn't give more than a mention to those stories, which left me feeling like here was another case of Americans looking out for their own or first world, white, Europeans anyway. But I won't quibble. The key issue and the source of our pain, as it were, is that we were all subject to a highly cross-cultural experience during our developmental years which was later taken away. Cultures that were not the experience of our parents (or one of them, as in my case). There was also the burden of being physically different thus being seen as the outsider (not so true for me in Thailand, but definitely true when I came to US). Then there's the incomplete multi-lingual aspect of being able to speak and not read one language or some complex combination that will later need explaining when people ask where you are from. We are also highly mobile, used to traversing the world often enough to have a favorite seat on the plane. Needless to say fear of flying is not one of our issues. Two more similarities startled me. We are predominantly part of a privileged community ie: servants, chauffeurs and perks were part of our life. The military brats living across the street from me had access to American movies that their father, who was in charge of entertaining the troops, showed in their living room during a cocktail party. (Island of the Blue Dolphins which disturbed me immensely, at age 5, because she shot the wolf; I watched until it recovered.) It took 3 years for only the most popular movies to get to BKK otherwise. They also got to shop at the PX thus I became acquainted with a chocolate bar called Hersheys. (Chocolate was not a known confection in Thailand until ice cream introduced.) My privilege came from the wealth that could afford to send my father to England to get his Ph.D. and me to private English speaking schools to hang with these others. TCKs also know they will be repatriated to their passport country. I knew I was being groomed by my education to be emigrated which is not quite same thing, but similar sense of destiny. The other was that we are conscious of representing a system greater than ourselves whether it be the military, or the church or Foremost ice cream or some other multi-national that sponsored the parental job. This was not my thing so much, but I did feel that I represented the love between two races, two nationalities and that whole UN thing of wanting world peace or, you know, you are just not going to be able to function and get back to see all your friends. I was proud to read of the young Americans returning to their home country and being appalled at the ignorance of their school friends who just did not care that there was a war going on in Bosnia or what. This is why TCKs so embrace Obama as one of them. He who understands, on a visceral level, why we have to get it right as a nation in the world. This book unearthed a new way to look at my history and it named some of the things that are still issues now and in fact would be helpful to discuss like my inability to commit to anything further into the future than next month for fear that it will all change. And for good. Entire countries lost. Friends never to be seen again, etc. etc. The benefits far outweigh these issues on an intellectual and experiential level, which is why the emotions are so in denial because it sounds like so much whining by privileged people. We are also adept at meeting new people, finding common ground, discerning dramatically different worldviews as well as subtle differences in perspective and fully immersing in what's going on now. On the surface we are also good at saying goodbye and moving on, but we carry several lifetimes of ghosts. People who flickered in and out of our world. Just like you all on flickr. Ha.